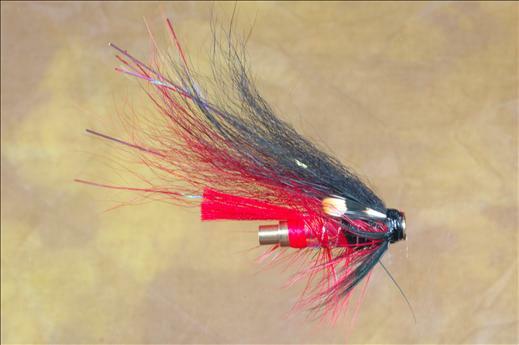 The Red and Black Templehund is a potent and rewarding member of the Templehund series of huge hair winged Salmon flies. Tube : Brass bottle tubes size .5"-1"
Tag : Red Glo brite multi floss. Tail : Red Glo brite multi yarn. Body : Rear half, glo brite floss with pearl mylar tinsel over. Front half, black ice dub. Hackle : Red, palmered over front half of body only. Rib : Oval silver tinsel, over front half of body. Wing : Red artic fox, strands of flashabou with black foxtail over top. Currently there are no comments about the Red and Black Templehund Bottle Tube fly pattern from other fly fishermen yet.